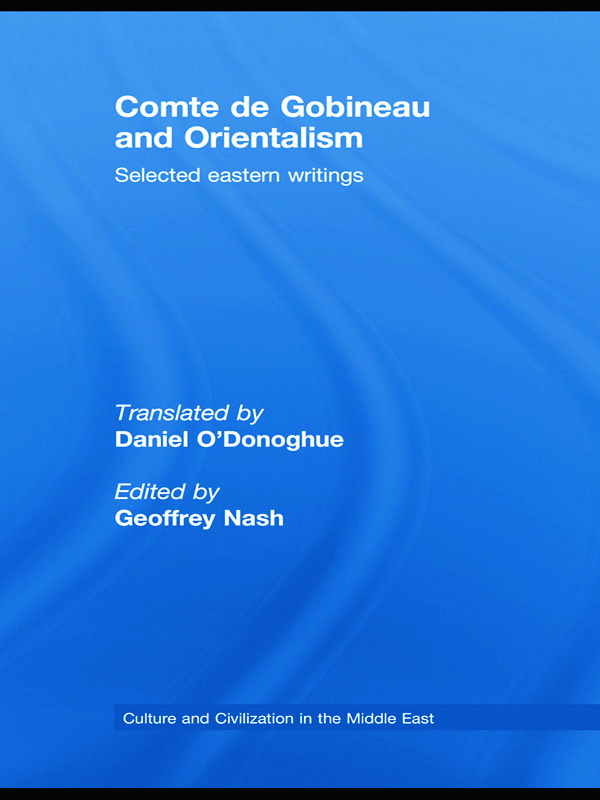 Though known to specialists, Comte de Gobineau’s vital if idiosyncratic contribution to Orientalism has only been accessible to the English reader through secondary sources. Especially important for its portrayal of an esoteric Sufi sect like the Ahl-i Haqq, and its vivid narrative of the Babi episode in Persia, Gobineau’s work impacted significantly on European intelligentsia, including Ernest Renan, Matthew Arnold, Lord Curzon, and the Orientalist Edward Granville Browne. Daniel O’Donoghue’s brilliant translation now makes available sizeable extracts from Gobineau’s two most important writings on the East: Three Years in Asia and Religions and Philosophies of Central Asia. Geoffrey Nash’s comprehensive introduction and notes contextualise Gobineau’s work in the light of contemporary scholarship, as well as assessing its impact on nineteenth century Orientalists and modern Iranians, and its relevance to debates around Islam and modernity that are still alive today. Geoffrey Nash was born in London and educated at Oxford and London Universities. He has been Senior Lecturer in literature at the University of Sunderland since 2000. Formerly, he was Associate Professor in the Faculty of Humanities, Qatar University. Daniel O'Donoghue graduated in 1996 with First Class Honours in German and Italian from the National University of Ireland (first prize in Greek and Italian). In the same year he obtained a similar qualification in Swedish from Trinity. He spent 30 years travelling to pursue musical and linguistic studies, including five years in Paris. He translates poetry into Spanish, and M.A. theses and technical German into English. He is published as a translator into French in the Humanist magazine Libre Pensée. He is also a concert classical guitarist, and in 2008 was nominated for a Grammy as arranger of the best Hawaiian album. This series studies the Middle East through the twin foci of its diverse cultures and civilizations. Comprising original monographs as well as scholarly surveys, it covers topics in the fields of Middle Eastern literature, archaeology, law, history, philosophy, science, folklore, art, architecture and language. While there is a plurality of views, the series presents serious scholarship in a lucid and stimulating fashion.